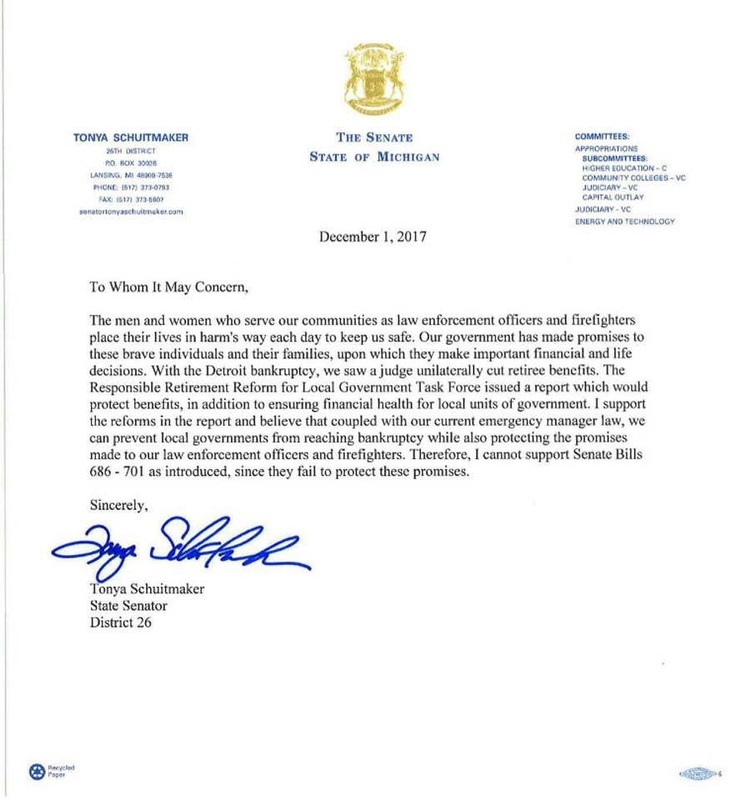 Senator Tonya Schuitmaker said, “The men and women who serve our communities as law enforcement officers and firefighters place their lives in harm’s way each day to keep us safe. Our government has made promises to these brave individuals and their families, upon which they make important financial and life decisions. With the Detroit bankruptcy, we saw a judge unilaterally cut retiree benefits. The Responsible Retirement Reform for Local Government Task Force issued a report which would protect benefits, in addition to ensuring financial health for our local units of government. I support the reforms in the report and believe that coupled with our current emergency manager law, we can prevent local governments from reaching bankruptcy while also protecting the promises made to our law enforcement officers and firefighters. POAM thanks Senator Schuitmaker for her continued support of Michigan’s law enforcement officers.